Happy Birthday, Miss Austen! Jane Austen Christmas Week Coming, Too!!! 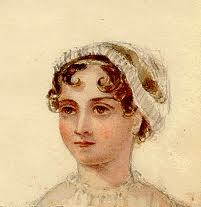 A very happy birthday to our darling Miss Jane Austen. and beautiful lights are shining! A delight to hearts young and old. Does she ever get boring!? No!! Guest Post~ Nina Benneton author of "Complusively Mr. Darcy"
I hope you'll drop by to spend some time over the holidays with us! Thanks, Mary. I hope people stop by!